Lebanon Valley will look to end 2015 with a victory and clinch the team's ninth season in 10 years with an above .500 record. LVC held King's to a season-low point total in the team's 10-6 victory last weekend. The Flying Dutchmen defense recorded seven sacks on the day. Brendon Irving is seeking to become just the second player in program history to record back-to-back 1,000-yard seasons, needing 26 rushing yards to do so. The Dutchmen and Albright are meeting for the 95th time. 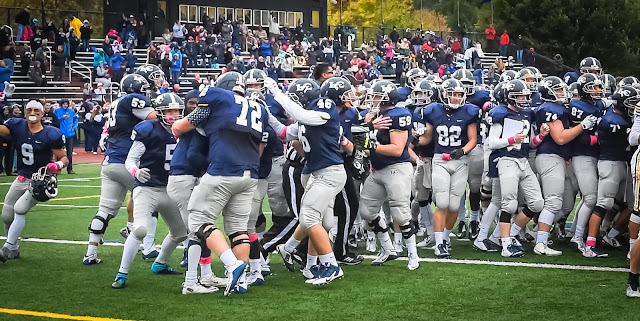 It is the oldest and most-played rivalry in LVC football, having first met in 1898. This is the 95th meeting in the rivalry ... Albright leads 59-32-3 ... It is the most-played rivalry in LVC history, and the oldest continuous, having been played every year since 1947 (excluding World War II years, it has been going every year since 1924) ... The first meeting was a 10-3 LVC win on Nov. 2, 1898 ... An unknown dispute led to a gap in the series between 1903 and 1912, despite the fact that Albright at that time was located in Myerstown in Lebanon County ... Jim Monos is 10-12 vs. the Lions. Tradition holds that if Lebanon Valley beats Albright, its oldest rival, then the LVC student body is to march up the hill to the home of President Lewis Thayne, Kreiderheim, and request the day before Thanksgiving (Nov. 25) off from school. That day is scheduled to be a half-day of classes. It's been four years since an orderly mob of Dutchmen, led by the football team and Annville police and fire personnel, marched from Arnold Field up the hill to Kreiderheim, where they were granted the day off by president emeritus Stephen MacDonald following LVC's last win over the Lions. A blocked kick in the closing seconds denied Lebanon Valley a chance at overtime as Albright held on to win 17-14 in the 94th playing of the rivalry. The Dutchmen (3-7) drove to the Albright 10-yard line but Malik Gilmore blocked Matt Smoluk's 28-yard field goal bid with 34 seconds left in the game. Brendon Irving ran for 177 yards and a touchdown to close the season with 1,255 yards, the second-most ever in a season; Tyler George caught LVC's other touchdown to finish with 12 for the year, also second-most by a Dutchman. LVC played turnover-free football but Albright's defense limited them to 260 yards; the Dutchmen defense was just as tough led by Andrew Livingston's 12 tackles and two hurries and a key Zach Wierman interception. Lebanon Valley rode a stellar defensive performance to a 10-6 victory over Middle Atlantic Conference (MAC) foe King's at Arnold Field on Saturday afternoon. A flea-flicker on LVC's second possession proved the difference as Tim Pirrone connected with Gary Wise for the game's only touchdown from 33 yards out following Ryan Fink's run-and-lateral back to Pirrone with 11:27 remaining in the first quarter. Ricky Feggins recovered a fumble following Tommy Garner's strip-sack of Tom Hehre on the previous drive to set up the Flying Dutchmen (5-4, 5-3 MAC) in King's territory. King's converted two consecutive field goals before Marcus Brownknocked down one of his own to cap the game's scoring in the third quarter. The Dutchmen defense held the Monarchs on fourth-and-25 late in the fourth quarter and LVC drained the clock on the next possession. Lebanon Valley's defense came to play in the team's 10-6 win over King's last week. As a unit, the swarming Dutchmen defense allowed a season-low point total and sacked King's quarterback Tom Hehre seven times in LVC's 10-6 victory last Saturday.Tommy Garner had a huge day, recording a career-high three sacks during the contest, tied for the sixth-highest single-game total in school history. Tom Gallagher (1.5), Andrew Livingston (1.5), John Salcedo (0.5), and Zachary Adams (1.0) also tallied sacks on the day. LVC ranks third in the MAC with 19 total sacks this season. Lebanon Valley's special teams played a huge role in the team's latest victory. Kick coverage man Kecelet Metra's hustle led to him making a diving, game-saving tackle inside the LVC 10-yard line on a 76-yard kick return at the end of the third quarter that would have given King's its first lead had the return man crossed the goal line. LVC's slight 10-6 advantage was preserved whenTyler Conlon broke through the middle of the King's line and blocked the Monarchs' 35-yard field goal attempt on the ensuing drive. Brendon McMinn blew up a King's punt attempt in the third quarter when he rushed off the edge and crushed punter Eric Haenggi at the Monarchs' 20-yard line, leading to Marcus Brown's 32-yard field goal on the ensuing possession. Spencer Moserplaced three of his five punts inside the King's 20, including his final boot of the day that was downed at the Monarch's five-yard line late in the fourth quarter. Brendon Irving continues to climb the ranks of LVC's all-time rushing leaders. In addition to sitting fourth on the program's all-time rushing list with 3,063 career yards on the ground, the junior running back needs just 26 yards to pass the 1,000-yard mark on the season for the second straight year. If able to do so, he would join Ben Guiles as just the second player in school history to rush for 1,000 yards or more in back-to-back seasons. Guiles was the first player to accomplish the feat when he racked up a program-record 1,330 yards on the ground in 2010 and followed it up with a 1,226-yard campaign in 2011. A win on Saturday would ensure LVC of finishing with a record of above .500 for the ninth time in the past 10 seasons. During the past decade, the Dutchmen won a program-record nine games in 2009, and clinched a share of the MAC championship and the school's first NCAA tournament berth in 2013. Only the 2014 season has seen Lebanon Valley finish with a sub .500 record (3-7) in the past 10 years. LVC enters this weekend averaging more than 31 points and 378 yards of total offense per contest. A strong offensive line anchored by Ryan Kingshill, Ryan Dotson, Bryant Weller, Tyler Good, and Zach Smith has allowed Dutchmen running backsBrendon Irving, Jon Jones, and Ryan Fink to rack up 236.2 rushing yards per game. Dual-threat quarterback Tim Pirrone has got it done with his arm when need be, throwing for 897 yards and 11 touchdowns to go along with four rushing touchdowns and a 139.9 efficiency rating in just five starts. Travis Saylor is tops among Dutchmen receivers with 363 yards and three touchdowns while Jeremy De La Cruz, Kyle Zimnik, and Gary Wise have each pulled in two TDs. LVC has been better protecting the ball as of late and holds a plus-two turnover margin. The Dutchmen defense is coming off its best all-around performance of the season and is allowing 21.8 points and 357.7 yards per contest. The unit has been strong against the run, allowing just 145.8 rushing yards per game compared to 211.9 passing yards per outing. Linebacker Trevor St. Clair, the team's leading-tackler with 61, has been the squad's most consistent defender with including 6.5 tackles-for-loss, three interceptions, 3.5 sacks, a forced fumble, and a fumble recovery. Tom Gallagher has made 48 stops from the linebacker spot, including three sacks, five TFL, and a pick. Safety Kevin Antol has 46 tackles, four TFL, two forced fumbles, and a 56-yard interception return for a touchdown. Defensive end Andrew Livingston's 3.5 sacks are tied for tops among Dutchmen while St. Clair, Antol, Gallagher, Ricky Feggins (3), Bryan Ek (2), Spencer Moser, Blake Lutz, and Zachary Adams have all picked off passes this fall. The unit has forced 22 total turnovers; 13 interceptions and nine fumbles. LVC's special teams has been a weapon this fall with kicker Marcus Brown twice earning MAC Special Teams Player of the Week honors thanks to his eight field goals made. The freshman's 35 made extra-points is the second-highest single-season total in program history. Spencer Moser is averaging more than 37.8 yards per punt with a long of 60 yards. He's also pinned opponents inside their own 20-yard line on 16 occasions and booted three kicks of 50-plus yards. Nick Newton's kickoffs are traveling an average of 52.5 yards per attempt and Michael Gaval was named to the MAC Honor Roll two weeks ago thanks to his kick returning prowess. His 45-yard return against Delaware Valley is the team's longest of the season. Kevin Antol and Guy Zimmerman have each blocked a punt, while Tyler Conlon added the unit's first field goal block last week. Albright has been one of the MAC's best teams this fall and is looking to wrap up the 2015 MAC championship with a victory over its top rival on Saturday. The Lions are averaging 36.4 points and 338.4 yards per game while the defense ranks second in the MAC, holding opponents to just 17 points per contest. The MAC leaders like to get it done through the air as Mike Knight has thrown for 1,479 yards and 12 touchdowns, while four wideouts have racked up 300-plus receiving yards this year. Steve Barroso and Kevin Mason lead the defense with 60 tackles apiece, while Barroso's five interceptions lead the team. Jamal Hayden has gotten after opposing quarterbacks, leading the Lions with 5.5 sacks, and the unit has made 55 tackles behind the line of scrimmage. Eight defenders have registered interceptions and thanks to his two picks a week ago, JaVaughn Patterson is the reigning MAC Defensive Player of the Week. The team has created 30 turnovers, 20 interceptions and 10 fumbles, and hold an impressive plus-16 TO margin. Albright enters the weekend ranked in both American Coaches Football Association (AFCA) and D3football.com Top 25 polls. The Lions are ranked no. 20 in the AFCA poll and no. 24 in the D3football.com rankings. Albright is the second ranked team LVC will face this season. The Dutchmen fell to no. 24 Delaware Valley 28-21 two weeks ago. As if there wasn't enough to be excited about, Saturday's matchup pits the top two scoring teams in the MAC against each other. Albright leads the conference in points per game with a 36.4 average while the Dutchmen currently hold the runner-up position with 31.2 points scored per outing. The teams have combined to score 40-plus points six times this season.